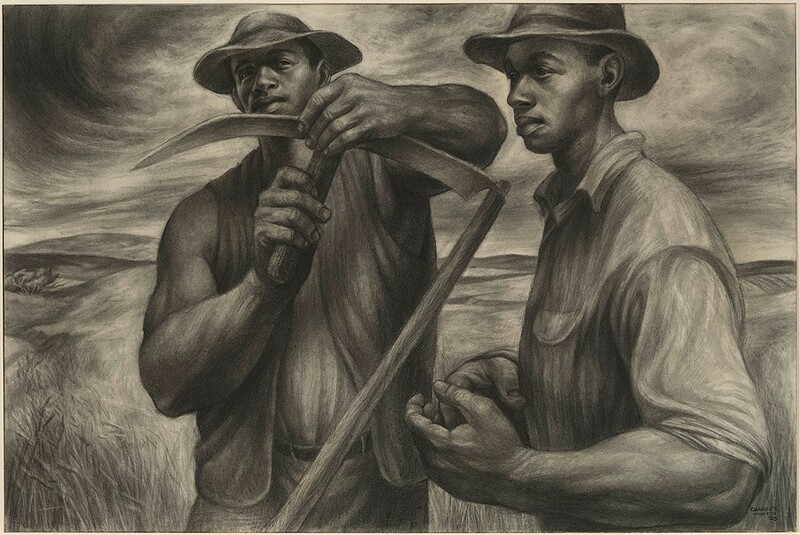 His work was a corrective to the rampant misrepresentation of African-Americans in art and history. Through 9/3: Fri-Wed 10:30 AM-5 PM, Thu 10:30 AM-8 PM, Art Institute of Chicago, 111 S. Michigan, 312-443-3600, artic.edu, $25, $19 students and seniors, free 14 and under and for Illinois residents Thu 5-8 PM. Sometimes it really is, as they say, all in the timing. 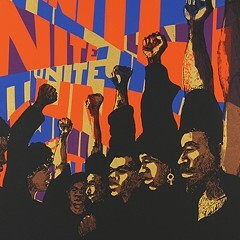 I happened to walk into the Art Institute's Charles White retrospective last month just as the show's curator, Sarah Kelly Oehler, was launching into a tour for a tiny clutch of people that included someone I recognized: Chicago's low-profile first lady (and onetime AIC staffer), Amy Rule. Since one doesn't always get the overview of a 100-piece exhibit directly from the curator's mouth, I attached myself (as discreetly as possible) to the periphery of this little group and tagged along. 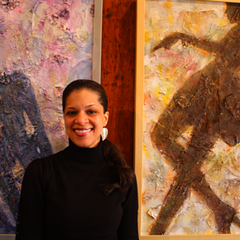 I wanted to hear what Oehler had to say about White's radically accessible body of work and about his career, which, as she quickly pointed out, was dedicated to correcting the record on the African-American experience. White was a talented muralist, painter, printmaker, and teacher, but-as this exhibit demonstrates in works like Harvest Talk and Black Pope and so many more that haven't been made available for publication here (I'm thinking particularly of the gorgeously textured Oh Mary, Don't You Weep, the wrenching series of "Wanted Posters," and the devastating wreckage of Birmingham Totem)-above all else, he was a master at drawing, creating life on paper or whatever was at hand with nothing more than pencil or pen. According to Oehler, he was one of the great draftsmen of the 20th century. 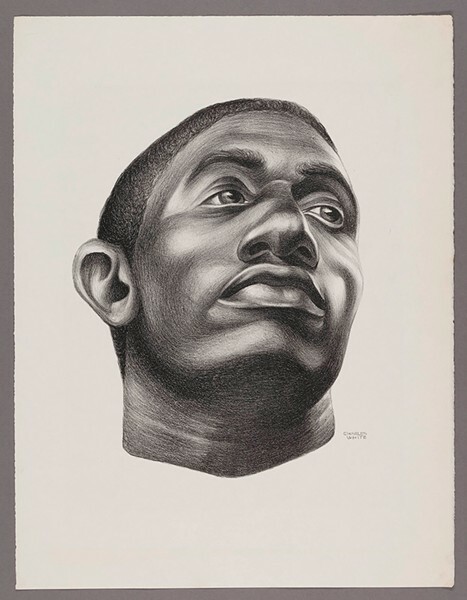 Born in 1918 on the south side of Chicago to a domestic worker from Mississippi and a Pullman porter, this black man named White managed to succeed as a figurative artist in an art world not only closed to blacks, but dismissive of anything figurative. His larger-than-life portrayals of African-Americans (both famous and anonymous) radiate substance, presence, and agency. They were deliberate correctives to the rampant misrepresentation of blacks in white-controlled mainstream history and art. The exhibit features a wall map of Chicago locations frequented by White as he grew up here. They include the former main building of the Chicago Public Library (now the Chicago Cultural Center), where, as a youngster, he was parked by his mother while she worked. He attended Burke Elementary School and Englewood High School (when he questioned the representation of blacks in history texts there, he was told to "sit down and shut up"), and, at the age of 13, won a scholarship to Saturday classes at the Art Institute. 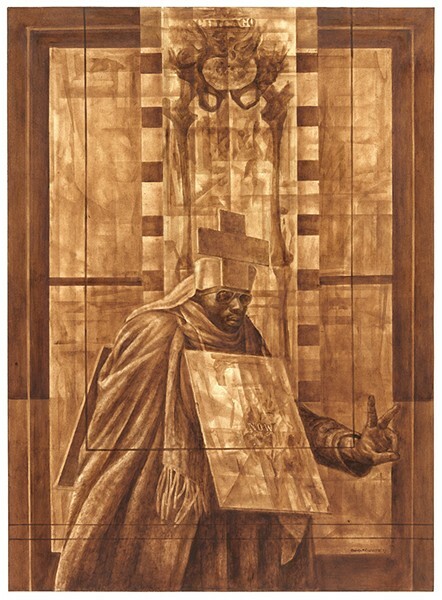 By 16 he was exhibiting with the Arts Crafts Guild (whose members were part of the Black Chicago Renaissance), and winning numerous art-contest prizes. 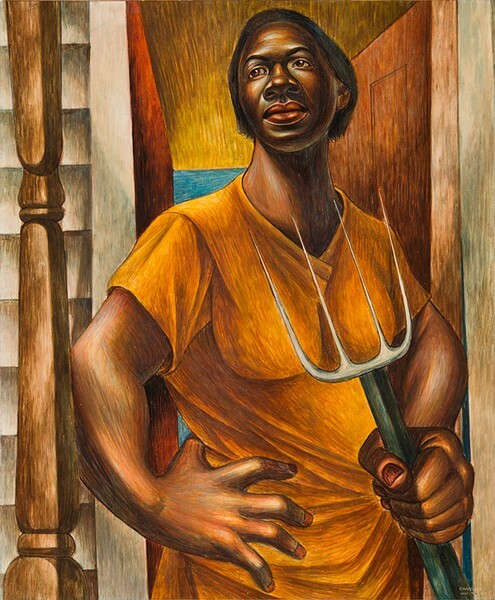 After graduating from Englewood in 1937, he attended SAIC on a scholarship, helped launch the South Side Community Art Center, and worked as an easel painter and muralist for the WPA. 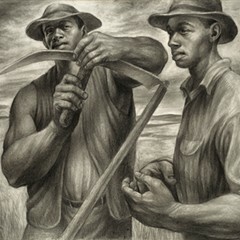 In 1941, he met and married artist Elizabeth Catlett, and left Chicago with her (they divorced in 1947). 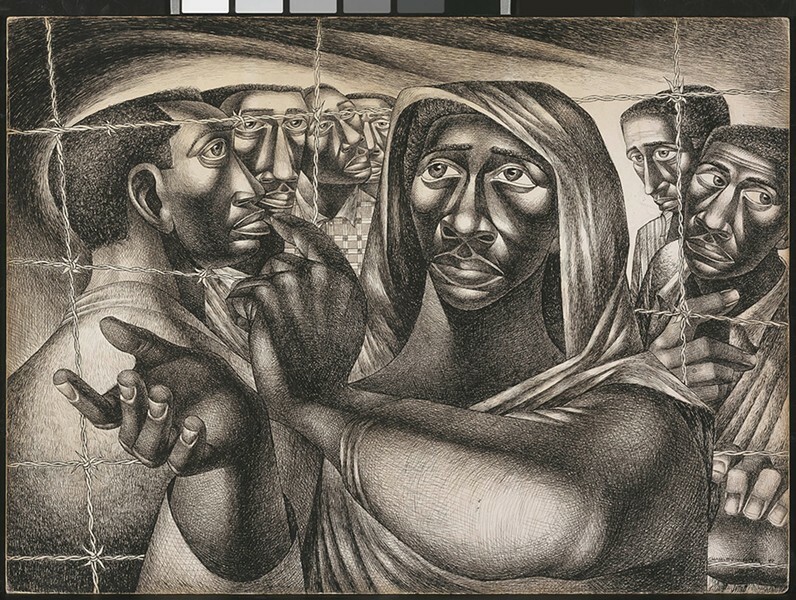 White, who fell ill with tuberculosis while serving on the home front in World War II, subsequently lived in New York City and California where, from 1965 to '79, when he died, he taught at Otis Art Institute. 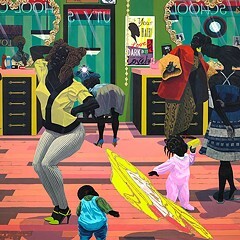 (The exhibit, cocurated by Esther Adler of New York's Museum of Modern Art, will travel to New York and Los Angeles after it leaves Chicago in September.) He married a second time, in 1950, to Frances Barrett, who was white, and, in spite of a McCarthy-era visit to Russia and enough Communist ties to get a subpoena from the House Un-American Activities Committee, established a career that was successful in both commercial and fine art. His goal was to have as many people as possible see his historically corrective work, and it was widely reproduced on calendars and record album covers and used in films and on television. 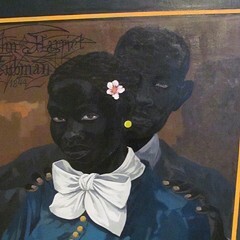 (One of the odder pieces in the exhibit is a triptych White created for the 1958 Sammy Davis Jr.-Eartha Kitt movie Anna Lucasta). Over the course of his remarkable life, he hung out with everyone from Margaret Burroughs and Paul Robeson to Harry Belafonte and Sidney Poitier. Near the end of Oehler's tour, White's son, artist Ian White, strolled into the exhibit. 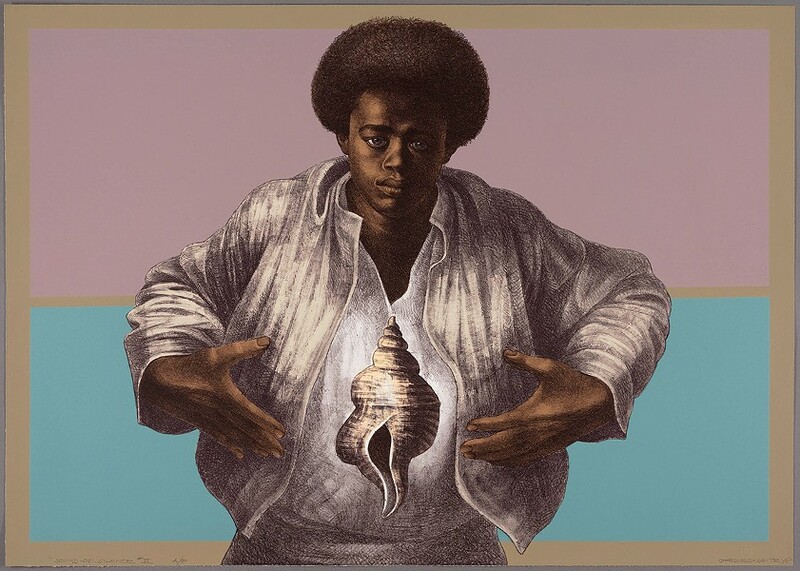 In town for an Art Institute event with his father's former Otis student Kerry James Marshall, White posed for a selfie with Rule and told me that the mysterious conch shells floating in the foreground of some of his father's last works are a reference to the family's Caribbean ancestry. At the event the next night, Marshall, who'd just seen one of his own paintings go at auction for a record $21 million, did most of the talking. He'd written the preface for the exhibition's excellent catalog (a hefty $50 hardcover, coedited by Oehler and Adler; unfortunately, there's no less expensive mini version), and had a lot to say about White's influence on him. He'd gone to Otis expressly because White was there, he said, and learned from him, among other things, that "to be an artist, you have to know something." A campaign backed by the Art Institute brought 58 American masterpieces to billboards, bus stops, subway platforms, and airports across the country this summer. But who noticed?